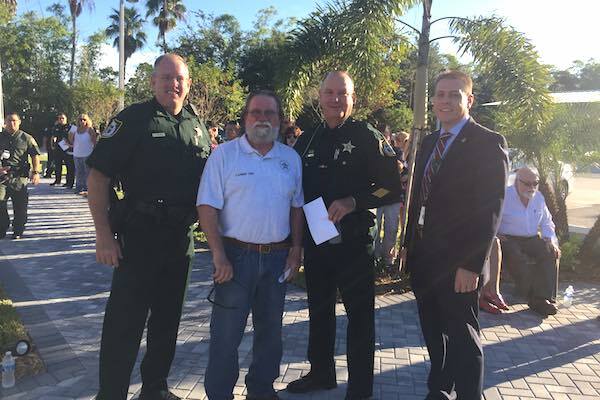 Indian River County Sheriff's Office K-9 dedication memorial. 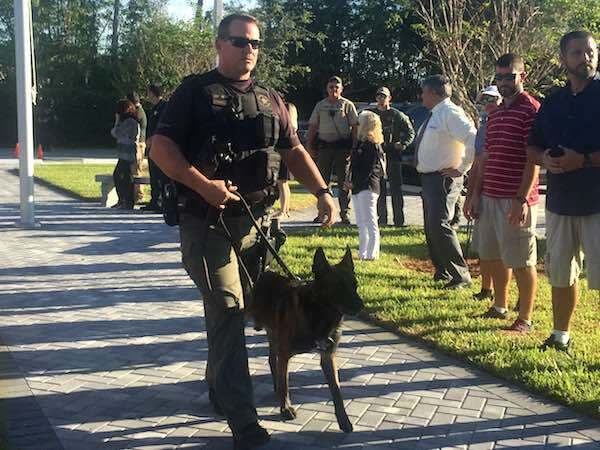 VERO BEACH – More than 100 people attended the unveiling of the K-9 memorial at the Indian River County Sheriff’s Office Wednesday. The K-9 program started in Indian River County in 1990. The memorial ceremony included current and retired handlers. The names of the K-9s that are currently working, passed or retired are all listed at the memorial. Sheriff Deryl Loar and Sgt. Christian Mathisen spoke at the dedication that ultimately unveiled a bronze sculpture of a K-9 by artist Lena Toritch, an artist from Salt Lake City, Utah. Left to Right: LT. Kent Campbell (former K9 sgt. ), Retired Deputy Toby Teague (former K9 handler) Sheriff Deryl Loar, Major Eric Flowers. 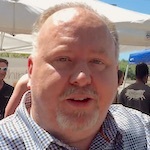 To fund the project, Sheriff Loar used money from drug dealers and forfeited assets after finding a clause with the U.S. Department of Justice. “We got together with a small budget and decided on how we would do this,” Sheriff Loar stated. Contractors who found out about the project soon came forward and donated their time. The money was used to buy all the materials to complete the memorial. “Having this K-9 memorial dedicated to all the active, retired, and past K-9’s is more meaningful to us than you’ll probably ever imagine. We greatly appreciate it,” Sgt. Christian Mathisen, who is currently in charge of the K-9 unit at the Sheriff’s Office, said in a statement. Active K-9 with the Indian River County Sheriff’s Office. “I cannot imagine what it’s going to look like in 5 or 10 years, absolutely beautiful. This thing will be here for the rest of all of our lives,” Sheriff Loar said. 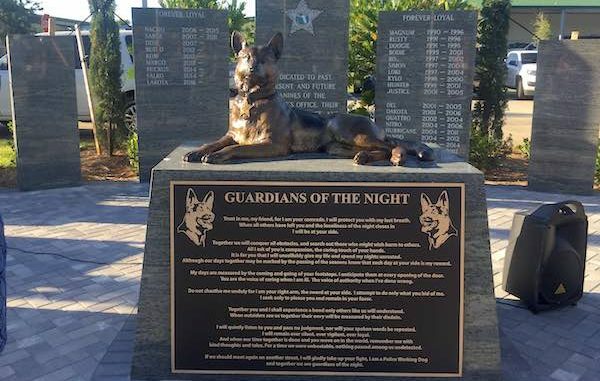 The K-9 memorial is worth visiting if you’re ever on the way to Vero Beach from Sebastian. It is located at 4055 41st Ave. Just take U.S. Highway 1 to 41st Avenue, go west until you see the Sheriff’s Office on the left. The memorial is in the center of the parking lot; you can’t miss it.